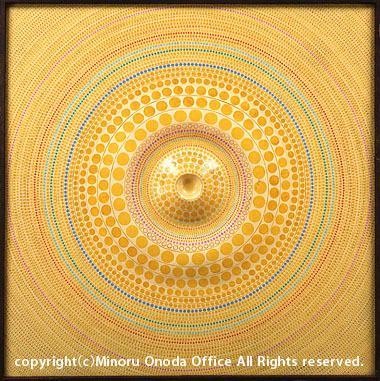 With seemingly inexhaustible patience Onoda("The Dot-maker") has strung together millions upon millions of dots in the creation of his artistic universe.Starting from a tiny point, his painting-through imagination, discipline and industry - develop cosmic dimensions, their inherent principle of perpetual proliferation giving the impression of organic growth. The dots spread in all directions, have no top or bottom but well out of themselves and stream endlessly beyond the picture frame. The artist, himself, sees them as an expression of life as well as automated mass production. 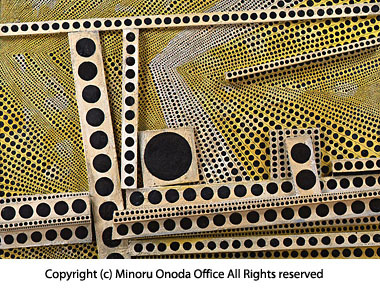 In the 1960s, as a Gutai Group member, Onoda created a point world on the slightly raised relief surface of boards. The points are ordered according to a mysterious schema; one moment they seem to follow a geometric pattern, the next a flower motif. The magic of these macro-structures lies in the energy radiating outwards from their centers. Seen in their entirety, the large figures are suggestive of microscopic cross-sections of flowers or coral, balanced in composition and reflecting an inner harmony. There is, however,an air of tragedy about these painting. The accumulation of countless elements and their endless proliferation are a reminder of the emptiness and meaninglessness of human activity, and in such a work we are surely confronted with the ghost of Sisyphus. 1964 3rd International Exhibition for Young Artists,Exhibition in Japan and Europe . 1965 Trends in Contemporary Japanese Painting and Sculpture,National Museum of Modern Art,Kyoto. Participated in the 16th Gutai Exhibition for the first time.Became a member of the group(Onoda joins Gutai).Participated in every Gutai Exhibition since then. 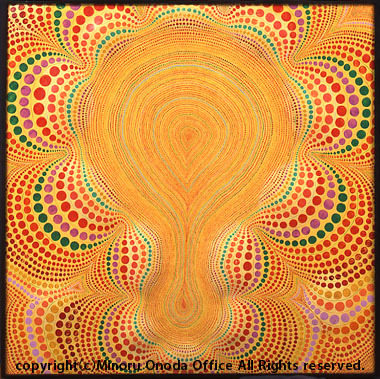 1966 the New Generaition of the Contemporary Art,National Museum of Modern Art,Tokyo. The 2nd Lausanne International Exhibitions, Musee Cantonal des Beaux-Arts,Lausanne. Organized Exhibition the Neo Art Exhibition,Hakusan Gallery,Kobe. Participated in the establishment of Artists'Union group.Paraticipated in every exhibition since then. 1976 Art Now'76,Museum of Modern Art,Hyogo. 1977 Solo EXhibition,Shunko Gallery,Osaka;Art Core Gallery,Kyoto. Ge Exhibition,Prefectural Art Gallery of Osaka. 1978 Graphic Works by the former Gutai members,Imabashi Gallery,Osaka. 2004 Gutai Retrospective, Hyogo Prefectural Museum of Art, Kobe. 2012 Gutai The Spirit of an Era,National Art Center, Tokyo. 2013 Gutai:Splendid Playground, Guggenheim Museum, New York. Ashiya City Museum of Art & History(Japan) The Miyagi Museum of Art(Japan) Himeji City Museum of Art (Japan) Hyogo Prefectural Museum of Art (Japan) Art Kite Museum(Germany) Private collections in Japan,Switzerland, United Kingdom and the United States of America.